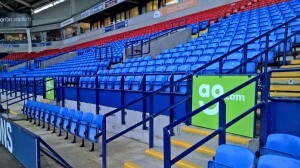 We have just accomplished an urgent project to print and install 36 laminated self-adhesive outdoor vinyl graphics with 'ao.com' sponsor adverts to cover 36 gates between the stadium sectors. We had just one day to adjust the graphics, book on the print queue and finish including laminating and trimming to size. Superfast turnaround has been proudly delivered in time for the Saturday match. All this was achievable thanks to the commitment of all of our print production staff as well as our fitting team. Our colleagues were applying the graphics in freezing weather conditions and dealing with quite difficult access to the surface of the football stadium gates. Let us know if you have any requirements for football stadium signage. 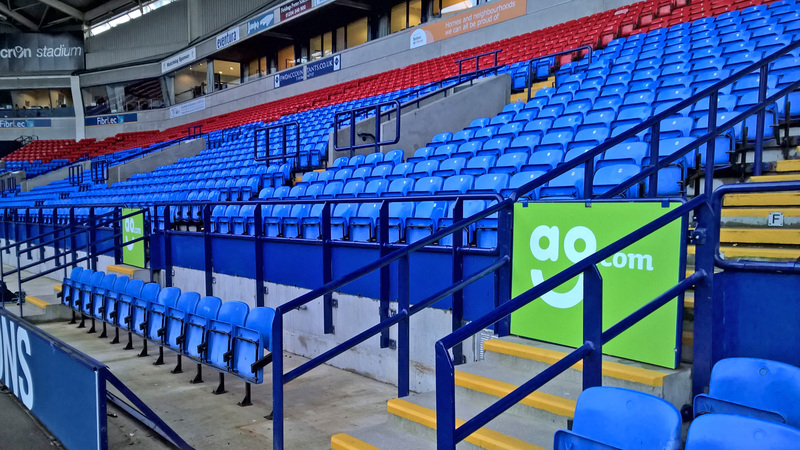 Here at Carrick Signs Ltd. We have a vast amount of experience in providing pvc banners, aluminium advert signs and vinyl graphics as well as correx football pitch advert boards for several football stadiums. Please get in touch to discuss any printing requirements or if you have any questions related to signage we can print and provide for your football stadium.